The U.S. has sanctioned three top election officials in the Democratic Republic of Congo for alleged corruption tied to the long-delayed presidential election. 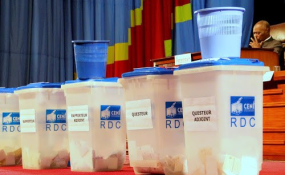 All three are senior leaders of the DRC’s National Independent Electoral Commission (CENI) and are accused of embezzling funds that were supposed to have been used to carry out a timely democratic vote. “We stand with the Congolese people who went to the polls on December 30 but remain concerned about a flawed electoral process which, following the presidential election, CENI continued to obstruct the democratic process and failed to ensure the vote reflected the will of the Congolese people,” Undersecretary of the Treasury Sigal Mandelker said Thursday. Although Treasury’s statement casts doubt on whether the vote was fair, it did not say whether it believes the election was rigged. Thursday’s sanctions target CENI President Corneille Yobeluo Nangaa, Vice President Norbert Basengezi Katintima, and adviser Marcellin Mukolo Basengezi — Katintima’s son. All three are accused of stealing funds that were supposed to be used for holding a presidential election in December 2016, but forced the vote to be postponed until December 2018. They also allegedly inflated the cost of the contract to supply voting machines by as much as $100 million and used the excess for personal gain, pay bribes, and find the campaign for outgoing President Joseph Kabila’s favored candidate. None of the three men have commented on the charges. Under the constitution, Kabila was supposed to have stepped down in 2016, but the long postponement, allegedly orchestrated in part by the CENI officials, kept him in office for another two years. Opposition candidate Felix Tshisekedi won the December election in what was the DRC’s first peaceful transition of power in nearly 60 years. But runner-up Martin Fayulu, who was also an opposition candidate, says he believes the election was rigged in Tshisekedi’s favor because he was seen to be less hostile to Kabila’s policies.